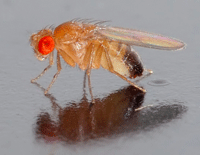 Oregon State University has released its latest update (PDF) on the spotted-wing drosophila (Drosophila suzukii), a dangerous and rapidly-spreading pest that’s new to the United States. This fruit fly attacks fruit still living and growing on the branch, rather than just dropped fruit. Thus, it has the potential to create problems not just for fruit producers, but obviously nurseries selling fruited trees too. If you see this insect, the Oregon Department of Agriculture wants to be notified. Call ODA at 503-986-4636 or 1-800-525-0137.